5.0 out of 5 starsAn excellent book that presents children with the courage to be nice to one another! Each chapter is an intriguing description of each character, scene & plot. An easy to read book that is very age appropriate. It deals with all the emotions a child in primary & secondary school will experience. Children want to enjoy their time at school, make friends & wonderful memories. This book tackles all that. Although this book target’s a younger audience, my16 year old daughter read the book and her assessment was “It is very light and easy to read. 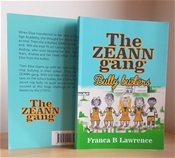 All children (including teenagers) would enjoy reading The Zeann gang because bullying has no age limit”. I highly recommend this book. I will look out for more books by the author - Franca Laurence. I bought the ZEANN Gang for my 9 year old daughter. I decided to have a quick read through only to find myself engrossed in the unfolding story of school life and how this amazing kids dealt with bullies. The narrative is so real and explicit that one wonders why bullying is still on going in Schools today, and how adults can be so blind as to what their children are capable of. Every child and parent should read the ZEANN Gang as it brings to focus what constitutes bullying. I would not have believed that such appalling acts of meanness can emanate from our children. However, the ZEANN Gang triumphed over the bullies, but it is the methodology and the result that shows the depth of the writer, in the narrative. I do recommend this book to every parent and child. Both will learn so much.